FindMotif, by running MEME, takes as input a group of DNA or protein sequences and outputs as many motifs as requested. Restrictions: At most 100 sequences per submission. Timothy L. Bailey, Mikael Boden, Fabian A. Buske, et al. 2009. 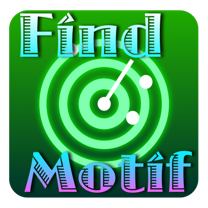 MEME SUITE: tools for motif discovery and searching. Nucleic Acids Research, 37:W202-W208.